Ray Villian was recently congratulated by John McFarlane, principal of Greenmount Bazadais Stud, Walkerston, and National Councillor for the Australian Bazadais Cattle Society Inc, after gaining the National Heart Foundation's Heart Tick approval for his Walkerston outlet. 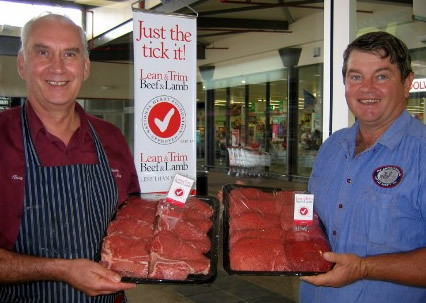 The owner of Walkerston and Mirani Country Meats, Ray Villian said that he saw the Heart Foundation Tick as a natural progression following on from his commitment to the use and promotion of lean red meat. Walkerston and Mirani Meats are the only butcher shops outside of France where Bazadais-cross meat is available as the main meat sold six days a week - and has been for over the last two years. "The Bazadais cross meat is already lean, with a very attractive red meat colour," said Ray Villian, "and yet maintains a delightful taste and texture. Often customers would ask if some of the cuts were in the Heart Foundation Tick programme." John McFarlane said this would have to be a plus for regional butchers to gain the same recognition as their city counterparts. 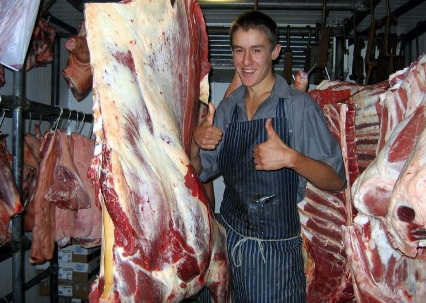 "I am very proud of this achievement by Walkerston Country Meats, and this should encourage other regional meat outlets to strive to gain the Heart Foundation Heart Tick," he said. 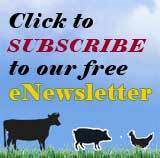 "As I see it, this as a great effort on the part of the Heart Foundation to promote the fact that lean red meat is very good for you and it's up to the red meat industry to support programmes such as these," Mr McFarlane said. Mr Villian added that there were strict protocols to follow, and he and his staff have embraced the new guidelines and look forward to the future with renewed enthusiasm and satisfaction. Bazadais beef the thumbs up!